What gets a writer happy dancing? Being a writer isn’t easy. Sometimes I feel as if I’m boldly seeking out new ways to experience humiliation. That’s why we really need our good excuses for a happy dance. 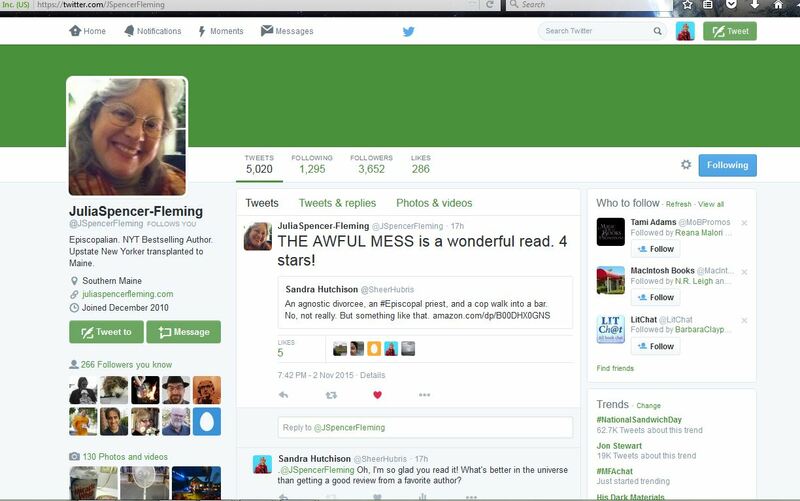 A favorite author compliments your book. This happened to me this week, and I lost sleep I was so excited about it. Julia Spencer-Fleming writes my favorite mystery/romance/something-more series of novels about the Rev. Clare Fergusson (an Episcopal priest) and police chief Russ Van Alstyne. I’m not a great reader of mysteries, but I adore these two characters and the whole series. Spencer-Fleming is also a very entertaining speaker in person. I pressed a copy of The Awful Mess into her hands at the end of a library event months ago, and figured she’d probably donated it away that night so she wouldn’t have to lug it home. But as I was doing some tweeting at the end of long day, suddenly this popped up! So: Woo hoo! And I’m going to say that counts as a blurb, right? The first good review by someone you don’t know in the slightest. Any meaty review that suggests someone “got” exactly what you were going after. The first positive review that arrives after a nasty one that sat up there at the top of the “most recent” reviews. When someone highlights a section of your work that you particularly love, too. Watching on Kindle Unlimited or Goodreads as someone swallows your book whole. The first time you sell more than a hundred copies in a single day. A single sale anywhere when they’re not coming steadily anymore. When a librarian says not only do they want to have you talk, they want to buy ten copies of your paperback. When a librarian posts a great review of your book on her library’s site. When you finally find a good way to write yourself out of a plot corner in your current draft. When you find out your book got clicked on or downloaded far above a promoter’s usual range. When you discover a new way to promote that looks as if it might actually allow you to make some money. When a blog post or tweet goes viral. When you get whatever yes you’ve been driving toward … publication somewhere, a full, an agent, a contract, a second contract … even if you know it’s just one milestone on a long, long road. How about you? Have you had any good reasons to happy dance recently?